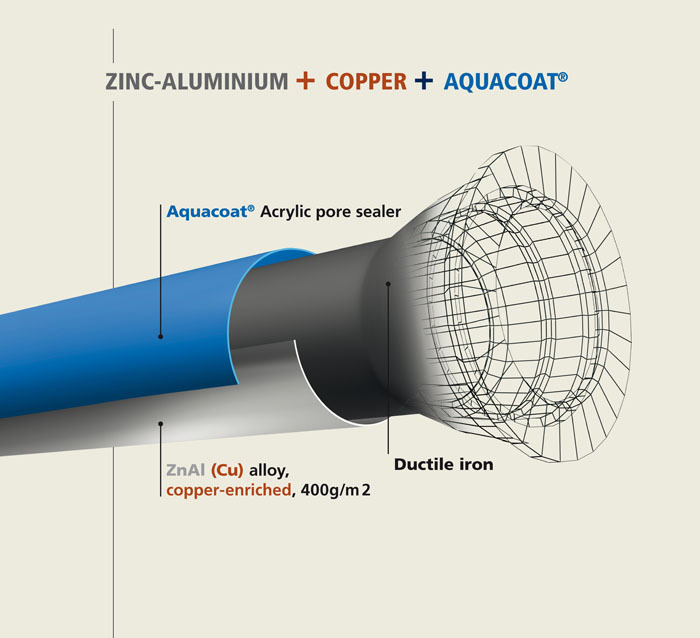 The coating for the Natural range of iron pipes consists of ZnAl 85/15 (Cu), and 85/15 Zinc-Aluminum alloy enriched with Copper, with a minimum mass of 400 g/m2 and a protective Aquacoat layer (80 µm thick on average). a layer of zinc-aluminum 85/15 alloy enriched with Copper with a minimum mass of 400 g/m2, applied by spraying molten metal onto the cast iron surface, using an electric arc gun and ZnAl (Cu) alloy wire. a protective Aquacoat layer (semi-permeable) of an aqueous phase acrylic-PVDC type, 80 µm thick, applied by spray gun and blue in colour. The BioZinalium coating conserves the 'active' properties of the Zinalium coating when it is in contact with soil. In contact with the surrounding soil, the BioZinalium slowly turns into a dense, adherent, impermeable and continuous layer of insoluble zinc salts. This forms a protective screen. The presence of aluminum increases the passivation effect even in highly corrosive soils, reducing the zinc consumption rate. Whilst allowing galvanic protection and self-healing, the Aquacoat paint promotes the formation of a stable, insoluble layer of Zinalium conversion products. This mechanism is the first to occur. One of the features of the BioZinalium external coating is its ability to restore the continuity of the protective layer in small areas which have suffered local damage. The Zn++ ions migrate through the pore-sealer to heal the damage, then form stable, insoluble corrosion products. BioZinalium therefore provides a brand new way of reducing this possible risk and thus increasing the guarantee of longevity. The active nature of the metallic layer + the deposited surface mass + the properties of the final layer are three dimensions that contribute to the effectiveness of the BioZinalium coating. - simplify the management of small diameter pipeline inventories. - soil containing waste, ash, slag, or contaminated by certain industrial waste products or effluents.